This hike is a simple loop trail that starts and ends at the paved parking lot at the park entrance. The actual time to do the hike is about 20 minutes to an hour depending on how much time you linger. The path is paved but uneven and broken in spots. This trail is not recommended for wheelchair access. 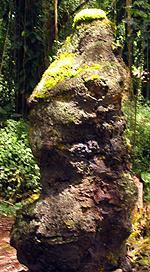 This trail is in the Lava Tree State Park in the lower Puna district. 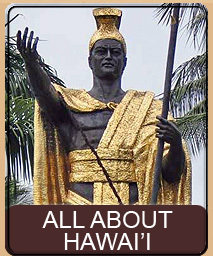 To get to the park take Highway 130 towards the town of Pāhoa. 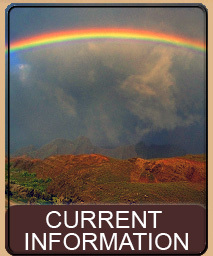 Pass the first intersection that takes you into Pāhoa and the next left. Continue until the next intersection which has a traffic light and make a left at the light onto Pāhoa-Kapoho Road (this is also Highway 132). Follow this road for about 3 miles until you see the park on your left. The park is open 24 hours a day, year round. There is no cost to visit the park. This hike is a simple .7 mile loop trail. Most of the trail has tree cover so you will not need sunscreen, hats or food - though you may wish to bring a bit of water and (of course) your camera. Three covered structures offer protection from the rain and also a perfect spot to enjoy a picnic. Bathrooms are available in the park but there is no drinking water. The trail, while paved through the entire hike, is narrow and often broken by large tree roots running under them. Care should be taken with small children and elderly in walking the path. 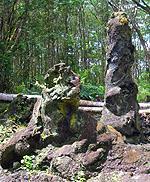 The molten lava overran this area drained, leaving the beautiful lava trees, into fissures in the ground. These fissures are very visible at the beginning of the trail, both on the left and right side of the trail. The fissures are over 30 ft deep. A sign on the trail instructs you to stay on the trail at all times. If you have children with you please make sure they do not leave the trail. Even if no fissures are evident, the vegetation may cover lava tubes and hidden cracks that could easily open up under someone and cause harm. 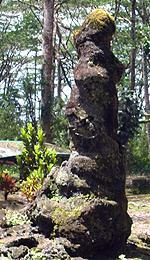 The Lava Trees in this park were created in a 1790 lava flow, which covered the area. 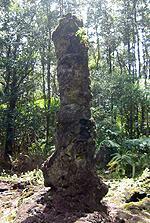 At the time this area was a native 'Ōhi'a Tree forest with trees growing up to 40 feet tall in a dense area. 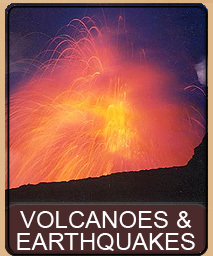 When the pahoehoe lava flow entered the area it filled the forest up to 11 feet deep in 2000° F molten lava. 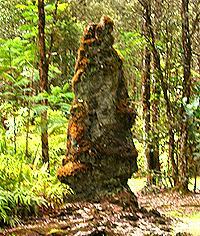 The lava that surrounded the web 'Ōhi'a trees started to cool immediately, due to the cool wetness of the trees, while the rest of the lava remained molten. While cooling, the intense heat of the lava also destroyed the trees leaving a perfect impression of where the tree once stood in the cooling lava. Shortly after filling the area a fissure opened in the ground. You can see the fissure at the beginning of the hike. 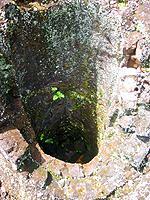 It is a huge 30 ft deep split in the ground on both the left and right hand side of the trail, near the restrooms. When the fissure opened it caused the molten lava to drain back into the earth, leaving the cooler already hardened lava trees standing. 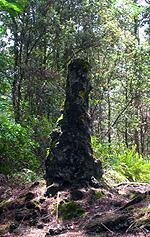 Lava trees can be found throughout the hike on all sides of the trail. Most of the trees are still standing though a few have fallen over offering another glimpse into the tree and how it was formed. 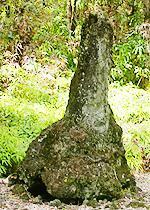 The trees are very interesting in shape, some of them very phallic and others resembling standing people or even faces. 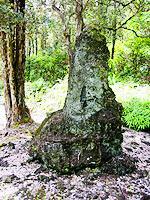 A few of the Lava Trees have broken and you can look inside of them to see the original print of the 'Ōhi'a tree that once stood there over 100 years ago. If you look carefully at the inside of the Lava Tree you can see the imprint of the bark from the tree that was pressed into the molten lava just before the tree was destroyed by the intense heat. 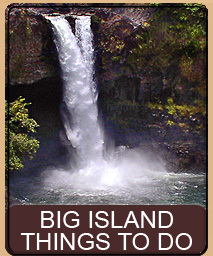 Lava Tree State Park has more than just lava trees. 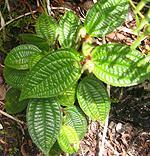 It is a 17.1 acre preserve of many native plants. 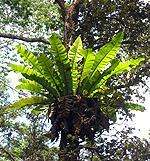 'Ōhi'a trees, 'Ēkaha (Birds Nest) Ferns, Hāpu'u Ferns, Uluhe Ferns, and Palapalai Ferns are just a few of the native plants you will see as you walk through the park. Near the beginning and end of the trail the native forest gives way to lush towering pines coated with climbing native plants. These huge trees support their own ecosystem of plants and insects and the leaves of the plants reach unbelievable sizes. 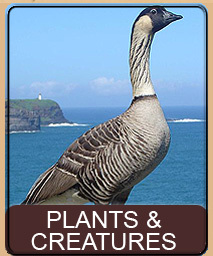 The Lava Tree State Park is also one of the areas where the state is performing experiments on controlling various invasive plants and animals. 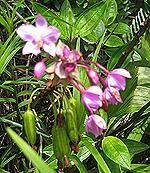 Specifically the Koster's Curse plant can be found growing in the Park as well as the obnoxious Coqui Frog. Recent efforts of the park in removing much of the non-native plants and trees have effectively thinned the growth and reduced the available habitat for the Coqui Frog - which were reaching over 22,000 frogs per acre in the park before efforts at control were undertaken. This page is named 'Hikes.ltree'. Can't Find It?